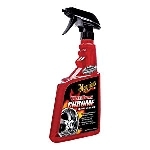 This highly-concentrated formula clings, penetrates, and loosens brake dust, grit, and road grime. Manufacturer-approved by BBS, Dayton Wire Wheels, and Tire Rack. Made from the highest quality ingredients, road grime doesn't stand a chance. Safe for all wheels; chromed, polished, powder coated, aluminum, or steel. Brake dust is tough stuff and can etch your wheel's finish if left unchecked. Road grime is more of an aesthetic issue, but when it combines with brake dust it can be double tough to clean. Griot's Garage Wheel Cleaner features a balanced, high-tech formula that is safe and effective on all wheels: chromed, polished, powder coated, aluminum, or steel. 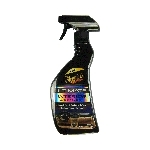 Wheel Cleaner is so effective it's approved by BBS, Dayton Wire Wheels, and Tire Rack¬.